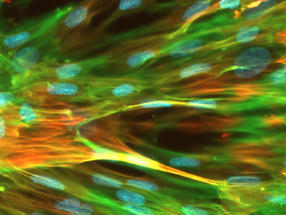 Smooth muscle cells regulate contraction of arteries and veins, the respiratory as well as the intestinal system. 12-Mar-2018: When scientists discover a new active substance, e.g. for use against a pathogen, they usually study its exact effect in cultured cells. But there is a lack of suitable test systems that simulate body tissues, because cells rapidly lose their specific properties once they are away from their natural environment. In a collaboration of the Helmholtz Centre for Infection Research (HZI) and InSCREENeX GmbH, a spin-off of the HZI, scientists developed a novel technology allowing cells from basically any tissue to be proliferated easily and reliably, while maintaining the cells' tissue-specific properties even in a Petri dish. This allows active substances to be tested and screened using organ-specific cells. Even patient-specific test systems for personalised medicine can be established with little effort. Scientists need primary body cells for many investigations, screenings of new agents and active substance tests. These cells originate directly from the respective tissue or organ. However, biopsies yield only small numbers of cells that are insufficient for broad screenings. For example: Although it is possible to obtain blood vessel-producing endothelial cells from umbilical cords, endothelial cells from adult donors are not available in sufficient quantities. There is a solution to this problem: Primary cells need to be immortalised in cell culture and, by this means, be induced to divide continuously. Basically, this procedure is not new: Cells bearing certain cancer genes have been immortalised in the past, albeit with dubious success. Although there is no end to cell division, the cells lose their typical properties and no longer reflect the original cells of the body. Researchers from InSCREENeX GmbH and the Helmholtz Centre for Infection Research have now developed a method that allows them to induce primary cells of any tissue and any donor to continuously divide in culture, while maintaining their characteristic properties. "We compiled a gene bank consisting of 33 genes that are important for division and the maintenance of tissue-specific properties of the cells or which suppress cell death," says Dr Tobias May, who is the managing director of InSCREENeX. "Using this bank, an optimal set of genes can be determined for any cell type that allows the cells to continue to grow and to maintain their functions at the same time." To be able to determine the optimal gene combination for different cell types, the researchers randomly introduced genes from their bank into the cells using virus transfer. Subsequently, they characterised the surviving and dividing cells and analysed, which foreign genes became integrated into the genetic material. "This is how we find out which cell type needs which gene set from our bank to be proliferated in the long-term. In addition, we tested the functions of the cells: For example, we checked which gene set allows immortalised liver cells to continue to degrade toxic substances," says Tobias May. The scientists have managed to immortalise more than 20 cell types from eight different species using this technology, including human cells. "We also transplanted the immortalised cell lines into mice and checked in these mice, if the cells can perform their natural function," says Prof Dagmar Wirth, who is the head of the research group "Model Systems for Infection and Immunity" at the HZI and cooperates closely with the InSCREENeX team. "Human endothelial cells, into which we incorporated our gene combination, successfully produced blood vessels in mice and these blood vessels were even getting connected to the vascular system of the mice." Accordingly, the new technology also allows the effect of new substances on human cells to be tested in a mouse model. Since the cells of any donor can be proliferated and cultivated robustly using the method of the researchers from Braunschweig, there are new opportunities for a personalised medicine as well: "Humans differ in their genetic design and as a result they might differ in how they metabolise medications. In addition, the toxicity and side effects of medications may differ from one patient to another," Wirth says. "Immortalised functional cells of different groups of people now allow exact tests on active substances to be performed in order to optimally adapt the active substances to each group." In addition, it is now possible to proliferate cells from diseased organs such that therapeutic approaches can be tested directly on the modified patient cells from here on.